A day that began with largely peaceful protests against Venezuela's socialist government took a violent turn Monday as fierce clashes between state security and demonstrators killed at least two people. 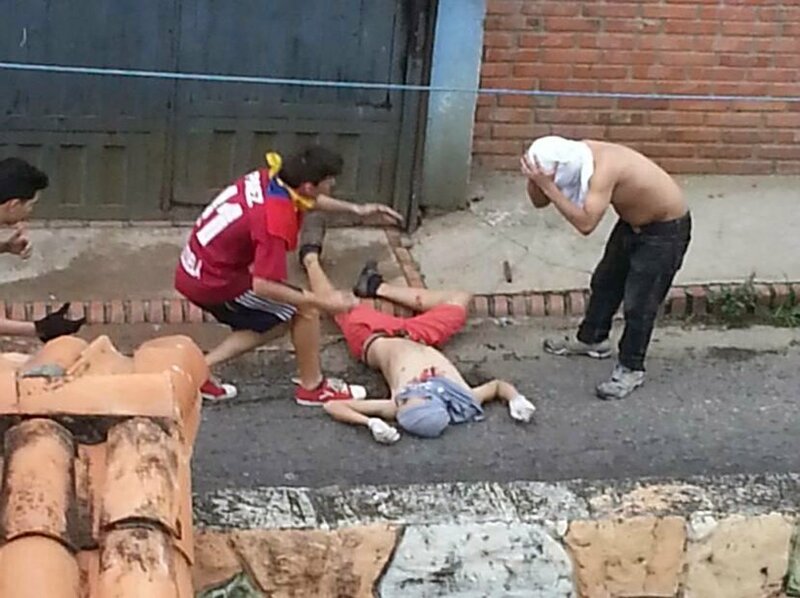 El joven Luis Alviarez, de 17 años resultó muerto la tarde de este lunes, mientras manifestaba en Palmira,municipio Guasimos, estado Táchira.La información la dio a conocer el diputado Richard Blanco, a través de su cuenta en Twitter. “Lamentablemente Luis Alviarez de 17 años perdió la vida en Palmira, Táchira en manos de la imprudencia e indolencia de la deshonrosa PNB”, dijo. 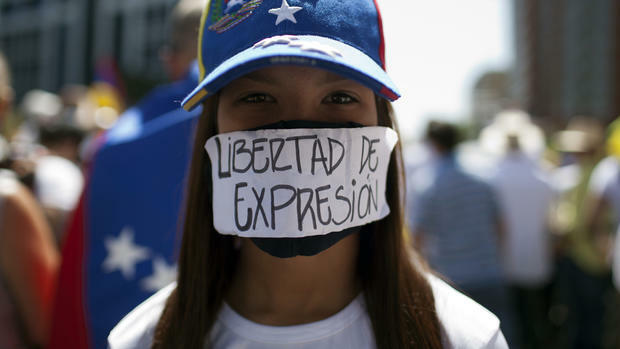 Thousands hauled folding chairs, beach umbrellas and protest signs onto main roads for a 12-hour "sit-in against the dictatorship," the latest in a month and a half of street demonstrations that have resulted in dozens of deaths. Protests in Caracas against President Nicolas Maduro remained mostly tranquil, but outside the capital demonstrators clashed with police and national guardsmen. In the western state of Tachira near Venezuela's border with Colombia, two men were reported dead in separate demonstrations: Luis Alviarez, 18, and Diego Hernandez, 33. Witness videos showed a man identified as Hernandez lying lifeless on the pavement, his eyes wide open, as a bystander ripped open his shirt, revealing a bloody wound underneath. "They killed him!" someone cries out. Elsewhere in Tachira, demonstrators threw rocks and set an armored truck on fire. Several buildings were set ablaze and dozens injured, including one young woman standing on the street, her face covered in blood. In the central state of Carabobo, three officers were shot, including one left in critical condition after being struck in the head, authorities said. 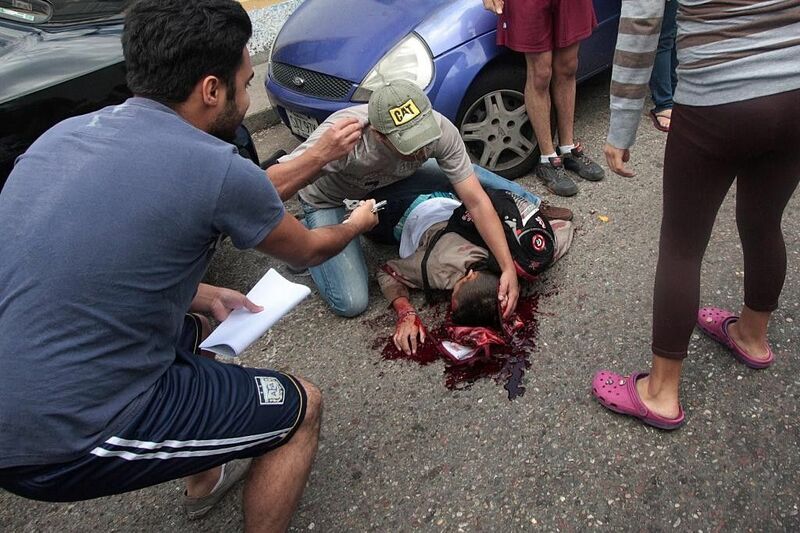 In Lara, a vehicle ran over three protesters. The violence added to a mounting toll of bloodshed and chaos as Venezuela's opposition vows to step up near-daily demonstrations and Maduro shows no intention of conceding to opposition demands. More than three dozen people have been killed, including a national guardsman and a police officer, hundreds injured and as many as 2,000 detained in nearly seven weeks of protests. International pressure on the troubled South American nation is continuing to increase, with the Organization of American States voting Monday to hold a rare foreign ministers' meeting later this month to discuss Venezuela's political crisis. The Washington-based group only convenes such meetings to address most urgent affairs. "We ask the world to look at what's happening right now in Venezuela," opposition leader Maria Corina Machado said after Monday's violence. "A deranged regime that represses and kills its people." Venezuela announced in late April that it would be leaving the OAS, which seeks to defend democracy throughout the hemisphere, and its representative was not present at Monday's meeting. Maduro contends the OAS is meddling in Venezuela's domestic affairs, infringing on its sovereignty and trying to remove him from power. The fiery Venezuelan president is vowing to resolve his nation's crisis by convening a special assembly to rewrite the nation's constitution, while the opposition is demanding an immediate presidential election. Polls indicate the great majority of Venezuelans want Maduro gone as violent crime soars and the country falls into economic ruin, with triple-digit inflation and shortages of many basic foods and medical supplies. The wave of protests were triggered by a government move to nullify the opposition-controlled congress in late March, but the demonstrations have morphed into a general airing of grievances against the unpopular socialist administration. As demonstrations take over Caracas almost daily, normal life has continued, but the atmosphere is suffused with uncertainty. At fancy cafes, patrons show each other the latest videos of student protesters getting hurt or defaced statues of the late President Hugo Chavez on their phones. 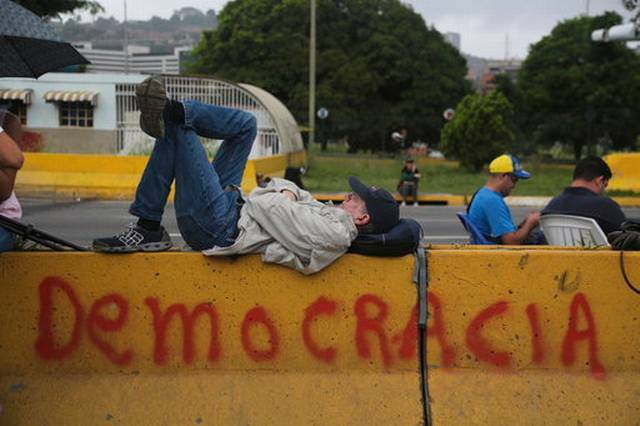 Working class people who have to traverse the capital for their jobs have adjusted their schedules to account for traffic shutdowns and take siestas to wait out clashes between protesters and police. On Monday, demonstrators assembled a giant rosary with balloons hanging from a Caracas highway overpass. A group of flamenco dancers dressed in black performed for the crowds. Others simply sat and held signs declaring their resistance. Former presidential candidate Henrique Capriles said the opposition would take its protests "to another stage" as Maduro continues his push to rewrite the nation's constitution. "We are against this fraudulent process," Capriles said on his radio broadcast. Tarek William Saab, the national ombudsman, whose job is to protect citizens' rights but who has been tagged the "dictator's defender" by the opposition, said on Twitter that he was pressing for an exhaustive investigation into Alviarez's death Monday to determine who was responsible and ensure they are held accountable. Maduro blames the opposition for the violence, claiming its leaders are fomenting unrest to remove him from power. The opposition maintains state security and civilian-armed pro-government groups known as "colectivos" are responsible for the bloodshed. Associated Press writer Hannah Dreier reported this story in Caracas and AP writer Christine Armario reported from Bogota, Colombia. A teenager has been killed in Venezuela during another day of mass protests against President Nicolas Maduro, officials say. Luis Alviarez, 18, was hit in the chest during clashes with police in the western state of Tachira. Opposition activists say another protester was also killed in the state. They been protesting almost daily for seven weeks to demand early elections and an end to the country's deep economic crisis. Nearly 40 people have been killed since the unrest began. President Maduro has accused the leader of the opposition-led National Assembly, Julio Borges, of inciting violence by calling people on to the streets. The unrest was triggered by a Supreme Court attempt to take over powers from the assembly on 29 March. It reversed its decision a few days later but by then the opposition had seized the momentum. Despite having the world's largest known oil reserves, Venezuela is facing a shortage of many basic items, including food and medicines. Its economy has collapsed, with inflation expected to top 700% this year, and crime is rampant. The opposition says the socialist governments of Mr Maduro and his predecessor, the late Hugo Chavez, have mismanaged the economy since coming to power in 1999. It is calling for early elections and the release of opposition politicians jailed over the past few years. Mr Maduro accuses the country's business elite of boycotting the economy to create unrest and topple his democratically elected government. His term ends in January 2019.